The length of the manufacturer’s warranty shouldn’t be the principle factor in selecting a roofing system. A good roof system requires proper design, quality materials, and quality application to perform successfully. The warranty alone doesn’t provide assurances of actual roof system performance. Selecting a quality roofing contractor and engaging in a proactive maintenance program is vital to the longevity of your new roofing system. Yet once the roof system is installed, more often than not, the roof is simply left unattended until a leak occurs. Nothing is more critical to its long-term performance than establishing a program of regular inspections and proper maintenance. A common misconception is that warranties are all inclusive and should cover virtually all roofing issues. It is far better to get quality installation upfront using quality materials than to rely solely on a written document for roof system performance. Roofs, like all components, require maintenance; in fact, most manufactures’ warranties stipulate that all roofs are required to have a minimum of two (2) inspections per year to keep the warranty in force. This requirement, although stringent, is a very good practice, particularly in Florida with its harsh roofing climate. Florida regularly encounters heavy rains, tropical storm type winds, excessive UV exposure, and high amounts of foot traffic caused by, among others, technicians maintaining A/C equipment. Warranties often contain exclusions which limits the manufacturer’s liability. Roofing systems should be chosen based on objective comparisons of proven roofing systems and on the contractor’s expertise and their ability to perform routine maintenance. Even a “20 year” roof cannot reasonably achieve such a life span without regular attention. In order for a warranty to be valid, materials manufacturers are increasingly requiring that building owners provide proof of regular inspections. Considering the amount invested in a new or replacement roof, regular maintenance is a small price to pay. A formal, long-term relationship with a professional roofing contractor providing roof maintenance will help protect your investment in your building and ensure the greatest life cycle value from your roofing system. In a Wall Street Journal Article (April 13, 1993) and in his textbook “Managing in a Great Change” (Truman Talley Books/Dutton), Drucker discusses the cost of non-performance. If a property manager or owner wants to save some money and skip a roof inspection, what can result? Here is an illustration: Imagine that a huge storm blows in, but the roof drains are blocked. Water cannot drain, it builds up on the roof, and the tremendous weight of the water causes the roof membrane to tear. Thousands of gallons of water burst into the building, soaking computers, furniture, company records, and the building interior. Materials and inventory are ruined, work stops for weeks, and income is lost. This worst-case scenario illustrates the merit of preventive roof maintenance. The common thread in all repair issues is neglect. However, developing a routine maintenance program for managing built-up roofs not only saves headaches, but also makes good business sense, by helping to lessen repair issues and to achieve the expected life from the roofing system. Select a maintenance program that is proactive (rather than reactive). It is better to identify and correct problems sooner than later. A proactive maintenance program can uncover and address minor leaks before they become catastrophic. Too many times roofs are only inspected after a leak occurs. While most leak calls are handled in a timely manner by a roofing contractor; warranty repairs can take time to be processed and the problem remains unresolved. The cost to repair minor roof leaks as soon as they occur is minimal. Neglecting your roof will result in costly repairs. Don’t wait until the damage is done; by being proactive it not only saves money it can save your roof. Identify and then eliminate the cause of small problems before they become big expensive problems. -Flashing: flashings are critical because a majority of leaks originate at these areas. A detailed inspection of the flashings should be made at locations such as skylights, perimeters, walls, penetrations, equipment curbs, and drains. 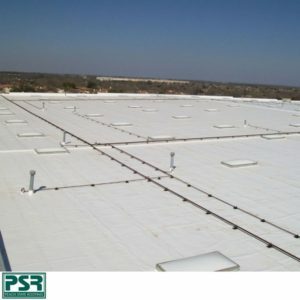 Flashings are typically stressed more than membrane in the roof’s field because of thermal movement, possible differential movement, and UV degradation. -Field: the field of a roof should be inspected for items such as surface wear, lap integrity, and overall degradation. A roofing professional should be able to recognize developing problems and provide proper repair methods. Roofing is a complex science as well as an art. A proactive maintenance program in place can provide an average roof life of 21 years compared to 13 years with a reactive maintenance program, depending on the roofing system and building type. An effective roof management program is a win-win situation. The owner gets a trouble-free and cost-effective preventative program. With a proactive maintenance schedule in place, the average life-cycle cost is 14 cents per square foot. The average reactive maintenance life-cycle costs are 25 cents per square foot.